While gluten free and easily dairy free, don’t let that fool you. 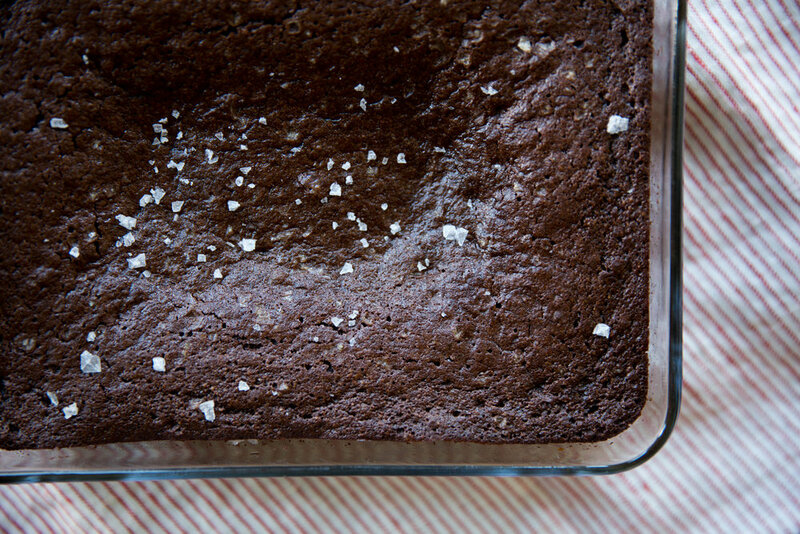 These brownies are decadent, full of body and flavor. I love slightly undercooking mine so the center is still soft and gooey. The outside pieces are slightly fluffier, but just as delicious. The grassiness from the olive oil comes out subtly and pairs wonderfully with the bittersweet chocolate - these are definitely more bittersweet than overly sweet. Whisk the wet ingredients together. In a separate bowl, sift the cocoa and almond flour; add in the sea salt and baking soda. Do not add the chocolate bar yet. Mix the two bowls together! Whisk continuously while pouring the wet into the dry bowl until batter is smooth. Fold in the chocolate bar. Oil an oven proof pan, about 8x8 large. Pour in the batter, using a spatula to get all the batter goodness. Top with maldon sea salt. Bake for 30-35 minutes or until the center comes out clean on a toothpick. ** I actually like my brownies slightly undercooked, so if you do too, then the perfect time to take out the brownies is when the outside is stiff but the center slightly jiggles when you give the pan a gentle shake. Make sure to let the brownies cool completely before slicing, this allows it to set and it will be much easier to handle.